The Scoop: Boatsetter is disrupting the idea that only wealthy couples can afford to have luxurious boating vacations. The company allows vessel owners around the world to rent their watercraft (from speedboats to sailboats) to people for day excursions or other events. This format provides boat renters with nearly limitless choices for their experiences on the water. Some prefer affordable outings that let them navigate where the wind takes them, while others choose ships with captain and crew included. Boatsetter is one of the only marketplaces of its kind and is introducing people of all ages and backgrounds to the joys of the open water. Depending on the vessel and the destination, a boating excursion can be anything from an affordable, adventurous romp to a high-end, luxury experience. Of course, for many couples, buying a boat isn’t in the cards. Boatsetter was designed to provide anyone with access to the water through a worldwide boat rental marketplace. The company connects water-loving people with whatever kind of vessel they’re seeking — including catamarans, yachts, sailboats, and speedboats — to create an exciting trip. “We have boats that provide affordable options for younger couples, as well as more well-off, older couples who may be looking to have a romantic weekend getaway,” said Rodrigo Alvarez, Marketing Coordinator for Boatsetter. Boatsetter’s Rodrigo Alvarez, left, and Jorge Cabré spoke with us about the platform’s ease of use. Rodrigo described one enviable trip that a couple looking for a cheap getaway could take to the Florida Keys. A 21-foot center console boat can be rented from a private owner in the Keys area for around $200 a day. From there, couples can navigate the boat to the Sombrero Reef to visit the area’s many small islands and local restaurants on the water. Some people even take boats from Fort Lauderdale, Florida, to the Bahamas, said Jorge Cabré, Boatsetter’s Marketing Manager. Another trip clients could take would be to rent a $5,000-per-night, 55-foot Azimut boat and sail to Puerto Vallarta, Mexico. The ship comes with a captain and crew that can take you to reefs, beaches, and unique rock formations. 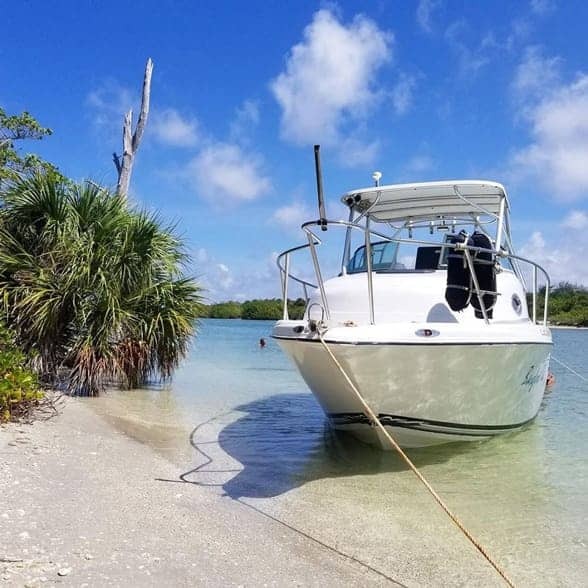 One of the benefits of renting a private boat is that you get to customize the experience, Rodrigo said, and trips like that often begin with a visit to Boatsetter.com. What’s helpful about Boatsetter is that the individual boat owners in the marketplace are typically experts in the locations where they’re renting. They’re likely familiar with local waters, and many want to provide renters advice about the best places to sail or boat. For instance, if you’re looking for the best place to see dolphins in the Florida Keys, a boat owner may point you to the perfect spot. That connection with owners is also valuable in setting prices. Boatsetter users can rent a vessel to explore beaches away from the highly populated tourist areas. Renters can often let owners know what their budget is, the length of time they plan to travel, and where they’d like to go. And Jorge has couples’ plans change based on feedback from boat owners. “The boat owners are the locals. They’re the ones who have the ultimate experience with their boats,” he said. For example, locals near the Bahamas have given Boatsetter users advice on where to find the swimming pigs of Big Major Cay and must-see iguana caves. This connection between locals and travelers is one of Boatsetter’s most useful features, and renters will soon have even more flexibility in renting boats and communicating with owners. Before Boatsetter, couples interested in boating typically either had to buy a boat or hope they could borrow one from a friend. While boat clubs are an older concept, the Boatsetter model is a much-improved version. In boat clubs, only members can take out boats from a specific location and marina. Boatsetter, on the other hand, lets members rent boats wherever they are for a set half-day or full-day price. In response to this model, different demographics of sailors are beginning to rent boats. Women — while only a small fraction of boat owners — are a much more significant percentage of Boatsetter’s customers. Further, younger people are renting boats from the Boatsetter. While the average boat owner’s age is closer to 60, Boatsetter’s typical user is 41 years old. Many of these younger renters love being out on the open water but aren’t interested in the hassle of caring for a boat of their own. “The millennial generation is more interested in the ease of renting a boat and paying for the experience,” Jorge said. Another way that Boatsetter is getting more novice users on the water is by including a captain with the ship. Those who don’t know how to navigate or aren’t interested in taking the helm can find a guided boat rental. Not only does this option get non-sailors onto the water, but a captain ensures that vacationing couples can navigate even the trickiest waters to their chosen destinations. Boatsetter brings boating to more couples around the world with its service. And the company wants to inspire those who may be interested in boating to give the company a shot. If you’re thinking about booking a boat for your next vacation, Jorge shared more destination ideas. Rodrigo shared an experience one of his friends had when he rented a boat from the company. Boatsetter offers new opportunities for ocean or freshwater fun that weren’t available even a few years ago. Boatsetter’s value lies in its options for one-of-a-kind excursions for couples. Boating options are flexible enough to accommodate fly-by-night vacationers or for couples who plan their itineraries months in advance. The types of boats also offer couples of varying means and interests plenty of options. “You can plan your trips around destinations and reserve lodging, or you can stop as you go, drop anchor, and spend the evening,” Jorge said.